The resources below are intended to provide you the information you need to best use and care for your SMOOTHTOE® and VO2FX® socks. If you have questions beyond what you see here, please feel free to contact us. Use this chart to find the SMOOTHTOE® or VO2FX® socks that are going to provide you with most benefit and comfort. Simply follow the instructions below for use and quickly find that SMOOTHTOE® and VO2FX® products are the easiest compression socks to put on and take off. Please handle socks with care as not to damage them. Jewelry and/or long finger nails can damage your socks. Orient the heel and toe of the sock to your leg and gently pull the sock over the foot until it covers your ankle. Pay attention to the placement of your heel in the sock. Gently pull the sock up and over the calf. The top band of the sock should be placed 2 finger widths below the bend of the knee. 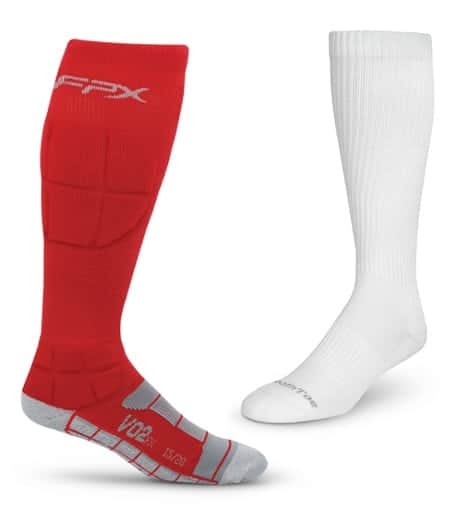 Proper placement ensures the the compression therapy is not restrictive. Evenly distribute and place the sock around the leg by gently massaging the sock into place and remove any bunching. To guarantee that your SMOOTHTOE® or VO2FX® products stay in the best condition possible, follow the care instruction below. 1. Machine wash with warm water and a gentle detergent. 2. Tumble dry on low heat. Prefer hang dry. 4. Do not use fabric softener.